LINCOLNTON – Joe Glass — a Freedom High graduate whose football head-coaching experience includes a stint at Patton – is the new head football coach at Lincolnton. His official hire as the Wolves’ new head coach comes after approval of a teaching contract by the Lincoln County Board of Education (coaches are then appointed by a high school’s principal). 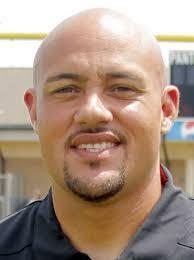 Glass comes to Lincolnton from Eastern Guilford and will replace Ledford Gibson, who resigned after four seasons. The Wolves went 12-3 and 13-2 in Gibson’s first two seasons then 6-7 in 2018 and 2-9 last season to miss the state playoffs after an 18-year run of postseason appearances. Glass’ move was previously reported, pending board approval, by The Lincolnton Times-News. Click the link below for the Times-News’ story on his officially being named at Lincolnton, which gives the South Fork 2A two new head coaches and the job at West Lincoln is open. Former head coach Bob McKay is returning next season at Lake Norman Charter. Every school in the eight-team league except Maiden will have changed head coaches at least once since 2015.